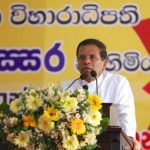 හිටපු අමාත්‍ය එඩ්වින් තිලකරත්න මහතා විසින් සුනාමි නිවාස ව්‍යාපෘතිය ස‍ඳහා පරිත්‍යාග කරන ලද සීනිගම පිහිටි අක්කර 5 ක ඉඩමේ ඉදිකරන ලද සිංගප්පූරැ ආකෘතියේ Shop House ගොඩනැගිල්ල ශ්‍රී ලංකා නාවික හමුදාවේ සහයෝගය ඇතිව ගංගාරාම විහාරස්ථානය මගින් වෘත්තීය පුහුණු මධ්‍යස්ථානයක් ලෙස ප්‍රතිසංස්කරණය කරන ලදී. 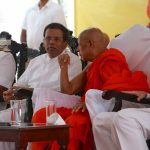 2016.12 .14 වන අද දින පැවති උත්සවයේදී අතිගරැ ජනාධිපති මෛත්‍රීපාල සිරිසේන මහතා සහ ගරැ අග්‍රාමාත්‍ය රනිල් වික්‍රමසිංහ මහතා විසින් එම වෘත්තීය පුහුණු මධ්‍යස්ථානය විවෘත කරනු ලැබීය. 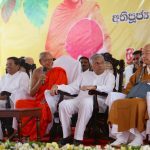 ගංගාරාම විහාරස්ථානයේ විහාරාධිපති ගලබොඩ ඥාණිස්සර ස්වාමීන්වහන්සේගේ ජන්ම දිනයද අද දිනට යෙදී තිබේ. 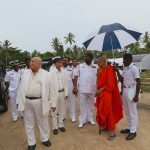 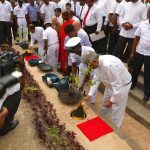 The Shop House building in Seenigama has been renovated into a vocational training centre by the Gangaramaya Temple with the support of the Sri Lankan Navy. 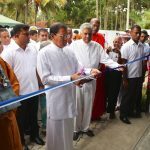 The structure of Singaporean design is situated in a five-acre land donated by the Former Minister, Edwin Tillakaratne for the Tsunami Housing Project. 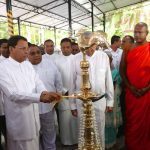 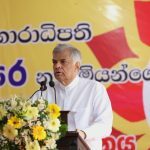 The centre was ceremonially declared opened by President Maithripala Sirisena and Prime Minister Ranil Wickremesinghe on 2016.12.14. 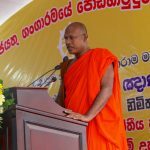 The birthday of the Chief Incumbent of the Gangaramaya Temple, Venerable Galaboda Gnanissara Thero falls today.